Don't Take Your Company's Reputation Sitting Down! Leading a corporate reputation initiative is a huge opportunity for your company and your career. 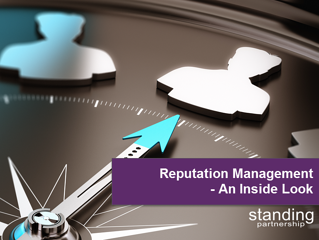 Luckily, getting started is easier than you might think with insights shared in our free e-book Reputation Management: An Inside Look. Organizations that step outside their daily operations to examine issues that could undermine their reputations are more likely to navigate successfully through volatile markets and times. Standing Partnership can analyze your reputational strengths and vulnerabilities in order to identify blind spots.